A large space with huge potential, this once out dated Indianapolis master bathroom fully embodies the common phrase “less is more.” By simplifying the layout and function of the room and updating the materials, this bathroom turned into a clean and sophisticated sanctuary. 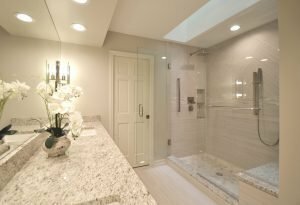 The existing “cave-like” shower and oversized roman tub were replaced with an expansive walk-in shower complete with a bench, recessed niche, & a hand-held showerhead. The new design includes a large linen closet for additional storage. Comfort height vanity cabinets with a make-up area complete the functionality of the new design. 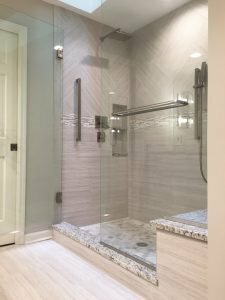 The same rectilinear porcelain tile on the floor in the bathroom was installed on the shower walls keeping the feel calming and simple, yet the change in pattern on the walls helps add a subtle touch of interest to the shower. The linear stone mosaic band also adds visual interest as well as emphasizes the spaciousness of the shower. White shaker cabinets serve as a clean backdrop for the speckling Giallo Verona Granite countertops. 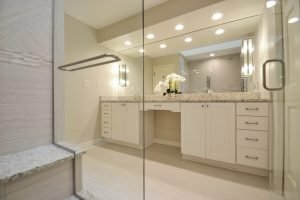 Boxy oversized cabinet hardware and plumbing fixtures are appropriately scaled with the large vanity and mirror, while two Hinkley wall sconces installed in the mirror provide sufficient lighting throughout the space and add a bit of sparkle to the room too. The natural tones freshen up the space while the new layout allows the room to feel large and spa-like. Overall, this minimalistic design is nothing short of a beautiful update to a once tired space. To begin designing your spa-like oasis, please visit our website at liveaco.com or call us at 317.575.9540.